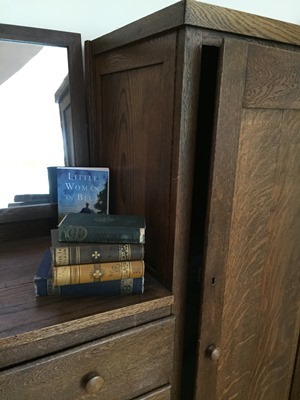 Jeannine Atkins, author of Little Woman in Blue: A Novel of May Alcott, is here today with an essay about finding the little details that can make an era and character feel authentic. Obsession and an eye for detail can take a writer of historical fiction a long way, especially when those collide in a perfect storm. I’ve been drawn to the Alcott family since I was a girl arguing with my sister about who got to play which sister in Little Women. As an adult, I studied the connections and contradictions between Louisa May Alcott’s real family and her fictional creation. The youngest sister in the novel is depicted as a spoiled girl who grew into a dilettante. In reality, May Alcott spent much of her adult life unmarried – while flirting wildly – in order to devote herself to art. May’s greatest successes, including having her watercolor copies of Turner sold at London’s National Gallery and work shown in the competitive Paris Salon, came after Louisa wrote Little Women. Still, Louisa seemed unimpressed. 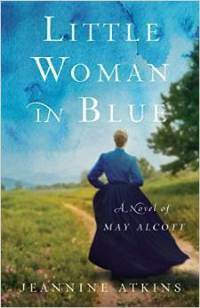 The warmth and grit between May and Louisa became the core of Little Woman in Blue: A Novel of May Alcott (She Writes Press, Sept. 2015). 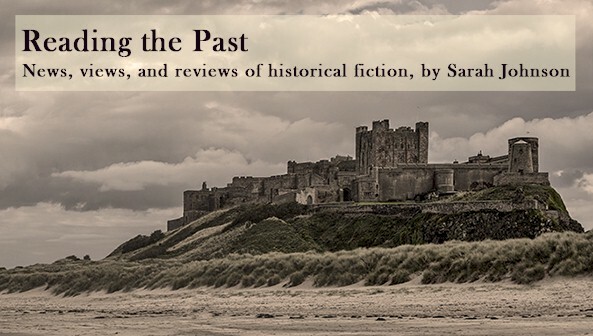 For me, writing historical fiction means spending years researching and imagining, so these had better be people that, like family members, you may not always approve of, but feel bound to by love, with all its highs and lows. Writers let that first flicker of “here’s a story” deepen into obsession as we follow clues around detours and past walls. All the Alcott family members kept journals and wrote letters, many of which were saved. Some have been published, while others are in archives. It’s great to swap pens for pencils and touch fragile paper in quiet rooms, but it’s not a moment-by-moment a thrill. Eventually that first hold-your-breath intimacy bumps into the realization that there’s more humdrum than drama. Like attics, diaries often are full of stuff that seems useless, but a dim corner may hold just what we need. My eyes glaze at accounts of vague miseries but light up when I find out exactly how long a game of whist lasted or the shape of shoe’s heel. I borrow these real things in hope they’ll make my fiction seem thoroughly real to readers. Writing based on real people means we’re given a shape, but to bring someone back to life, we must draw from a richness of stuff, plundering untidy closets and cupboards. Maybe an apple core or an old paint box will bring a story to life. Always, mystery abounds. In addition to her newest release, Little Woman in Blue, Jeannine Atkins is the acclaimed author of twelve books for young readers featuring women in history, including Borrowed Names: Poems about Laura Ingalls Wilder, Madam C. J. Walker, and Marie Curie and their Daughters. She is an adjunct professor at Simmons College and the University of Massachusetts-Amherst. Visit her website at www.jeannineatkins.com. The story of the baby passed from sister to sister is to me the most stunning part of the May/Louisa story. What ever became of that child--as an adult, I mean? Shelley, you can read more about the baby named Louisa, called Lulu, at the end of Harriet Reisen's excellent biography, LOUISA MAY ALCOTT: THE WOMAN BEHIND LITTLE WOMEN. warning: It's not all sweet, but not all terrible either!